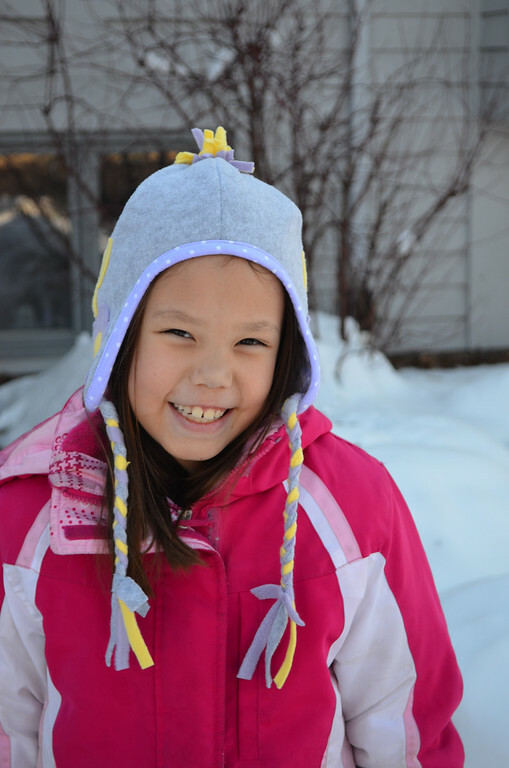 Welcome to Part Two of winter hat making! and dividing the circumference by six, to get the width of the panels that manifest as those six pointy bits at the top of the pattern. 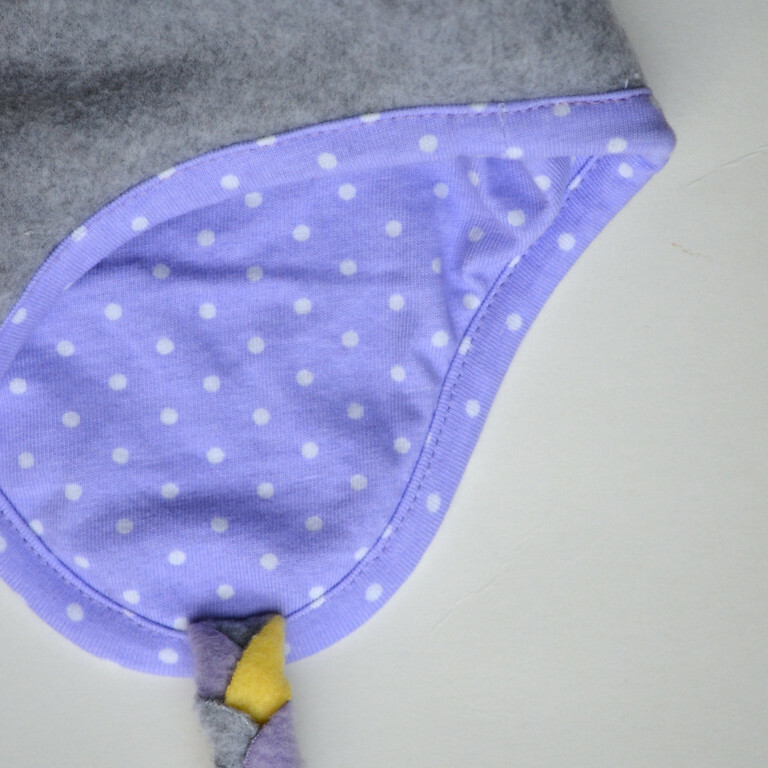 The two lower bulges of the pattern are the integrated ear flaps. Let's begin. 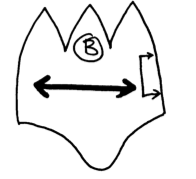 Pattern B is similar to Pattern A in that it is made of six equal parts. However, it differs in that it utilizes darts to shape the rounded top instead of entire seams running the length of the hat. Start out by making the fancy embellishments (see Part One for more detailed instructions). Then sew up the darts in both the outer fleece layer and the knit lining layer. Don't forget to leave a hole in one of the lining darts for turning out later! 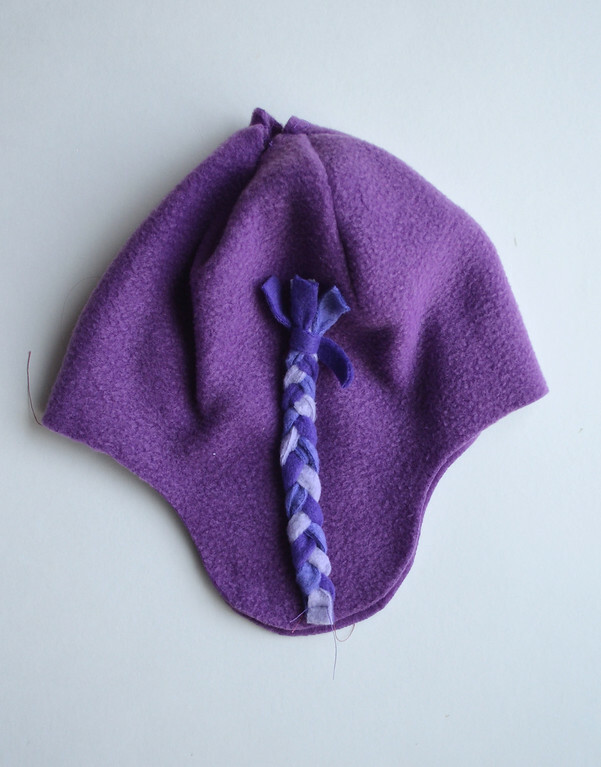 Now attach the braids, upside down, to the RS of the outer fleece ear flap (shown), as well as the pompom to the apex (not shown - see Part One for instructions). 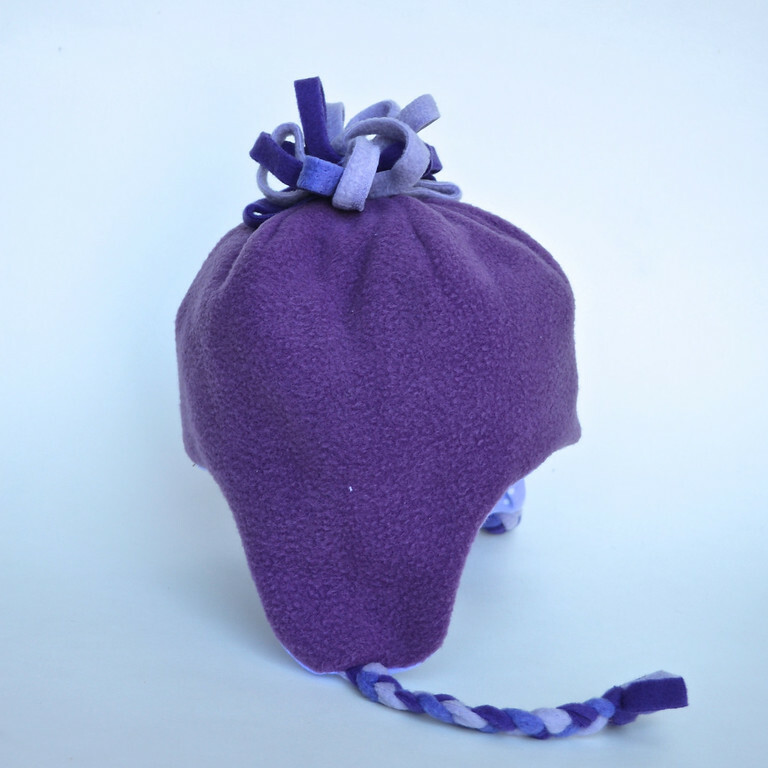 Then stuff the outer fleece layer into the lining layer, RS together, lining up the ear flaps and center back seams. 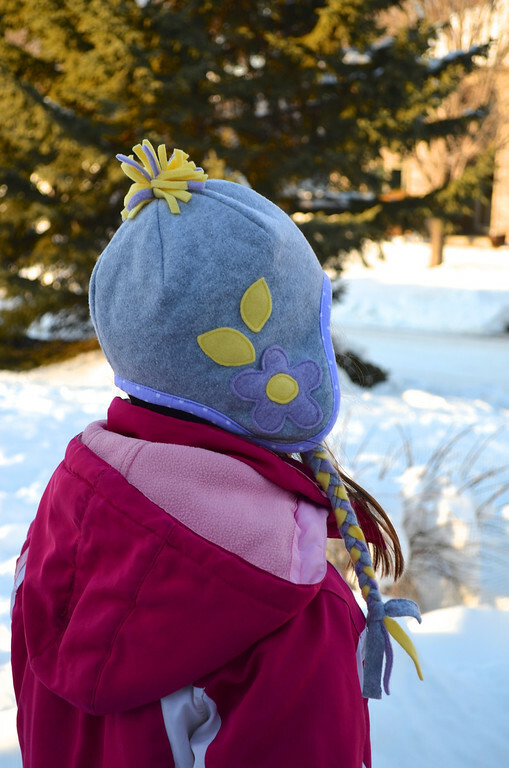 Sew around the bottom hem (which goes around the face, neck and ear flaps) of the hat to attach both layers together. Turn right side out through the hole in the lining, stitch the hole shut and stitch together both hat layers at the top point where all the darts meet. 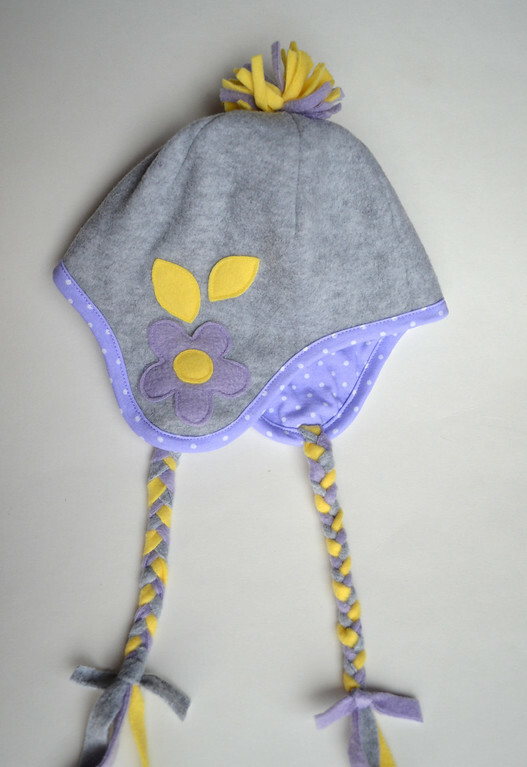 Here are both sides of the hat -outside and lining-side. 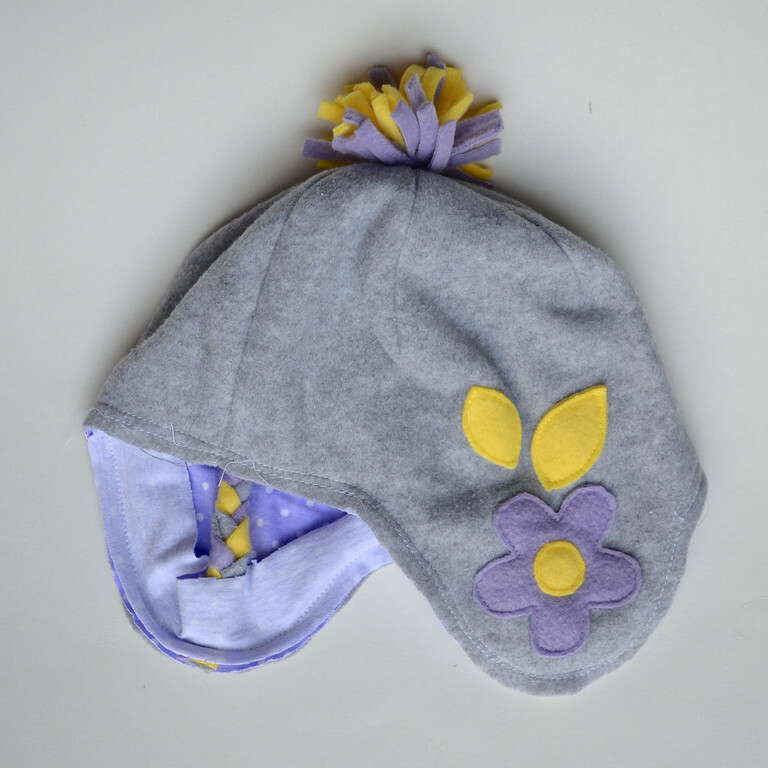 Yes- theoretically reversible, except the pompom makes wearing the hat inside out a bit uncomfortable. 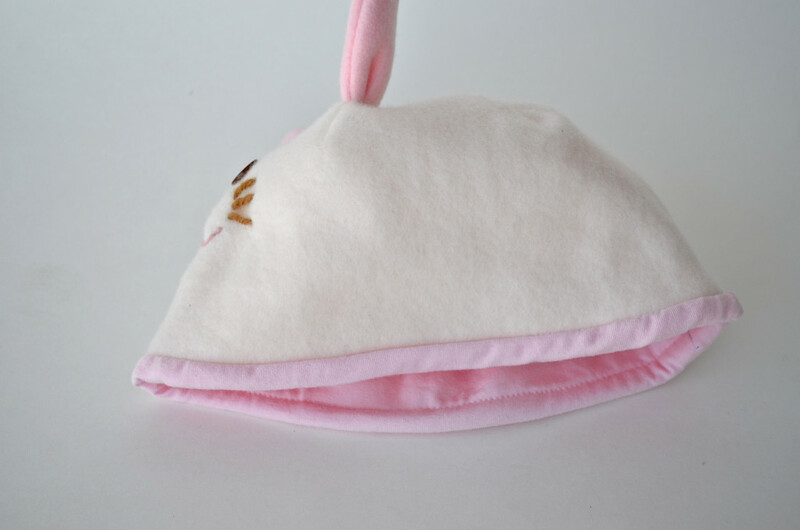 The ear flaps were completely sliced off to make a smooth bottom hem. The lining hem was lowered by 1" (so that the whole hat lining is 1" longer than the outer fleece hat). That extra 1" was for wrapping around to the outer side of the hat to make the contrast self-bound trim. Again, this is optional but I wanted a little more color against the otherwise very plain white hat. Sew outer and lining darts closed, inserting tail and ears where desired. 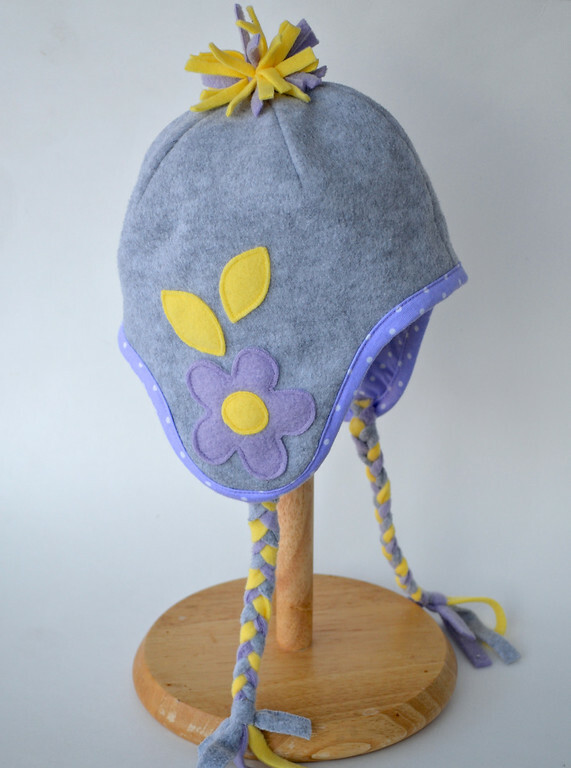 Embroider details on outer hat. Place outer hat in lining hat, RS together, lining up their circumference edges. Sew both layers together around their circumference. Turn entire hat right side out through hole in lining. 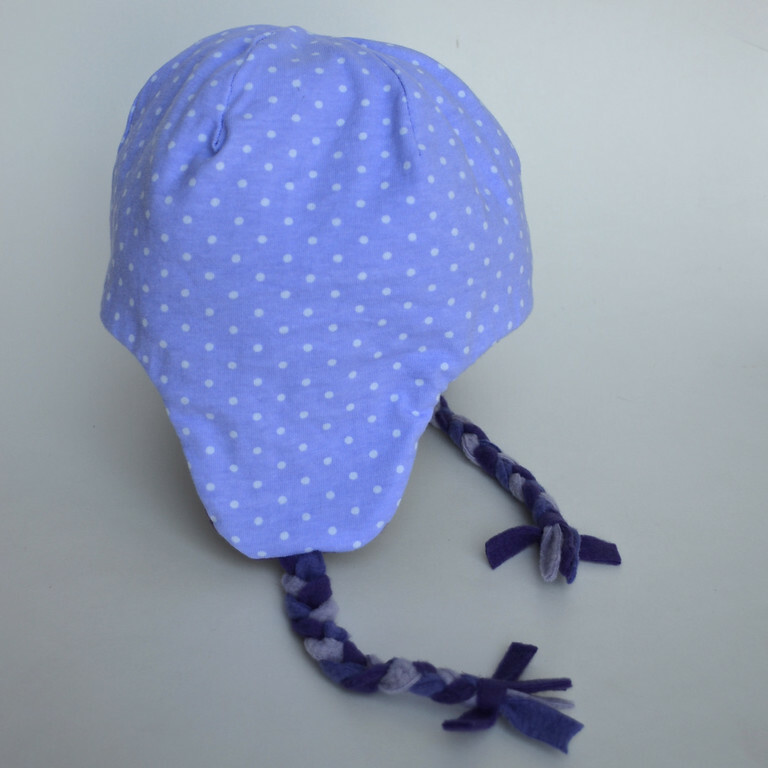 The lining, being longer than the outer hat, will wrap over the hem of the outer hat to make an edging that is the same width as the seam allowance you gave. Stitch in the ditch as shown in the photo above, to keep the hem in place. Finish the hat: stitch the lining hole closed etc. And just so you know that I can live with sewing imperfections - see that wrinkle in the pink binding right in the front of the hat? It's not a fancy ruffle, OK? The lining was one of those unstable 4-way stretch jerseys, and its circumference was a little bigger than the outer fleece circumference. So it sheared while I was sewing it and I was too tired to unpick the whole thing, take in the ease at the center back seam and... well, you get the idea. 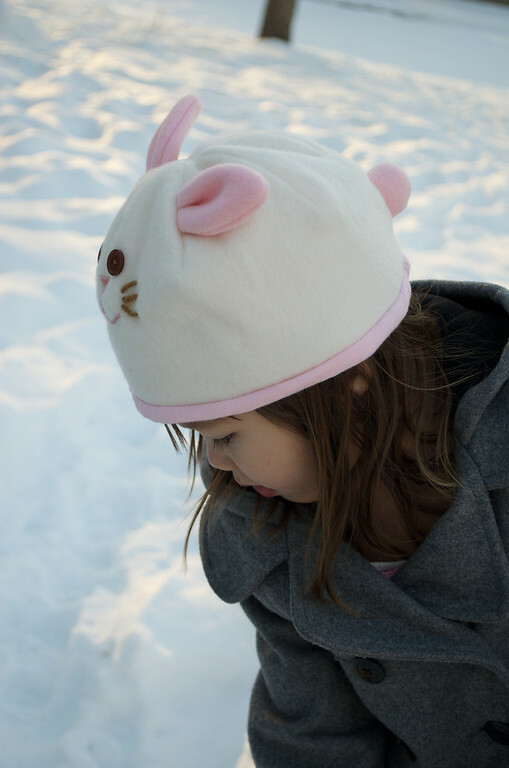 This third hat is identical to the first hat worn by Jenna, except that it has bound edges. 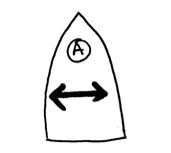 (Also applique, which is kinda obvious but it's just embellishment and not significant to the construction process). 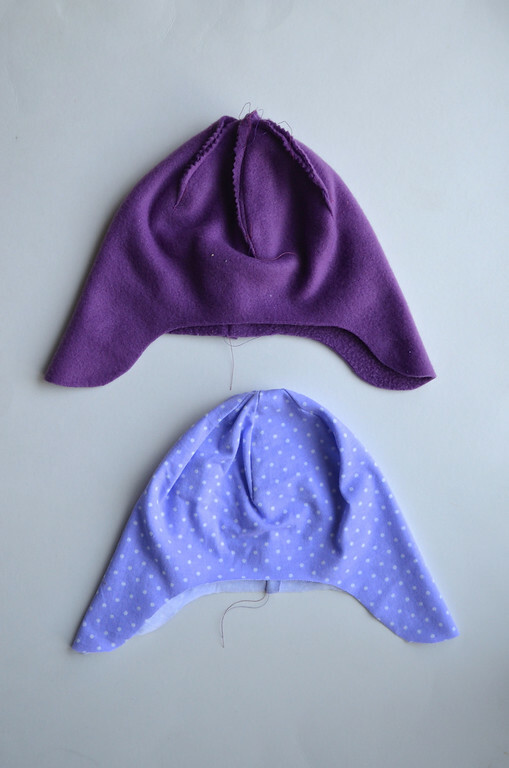 the two hat layers, after having their darts sewn closed, are sewn together with their WRONG sides touching. there is no turning-right-side-out so you don't need to leave a hole in the lining. 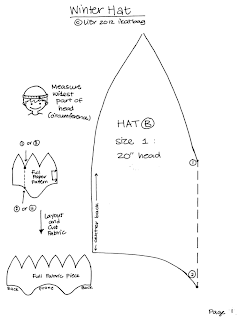 you are binding around the actual finished edge of the hat circumference, so you don't need a seam allowance around the bottom edge of the hat. 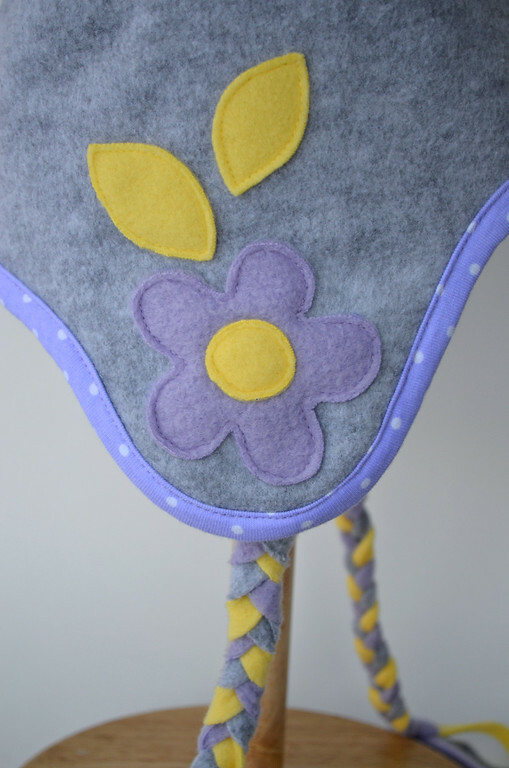 the braids need to be attached differently in order to accommodate the binding. 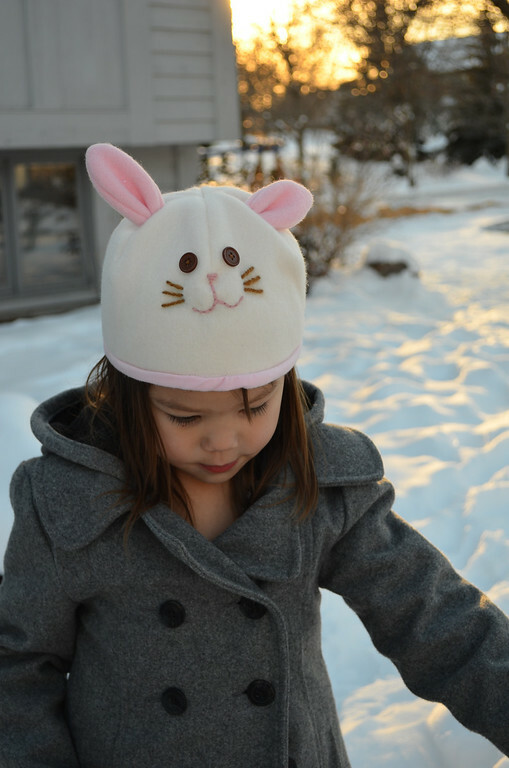 Sew both hat layers together, WS touching. 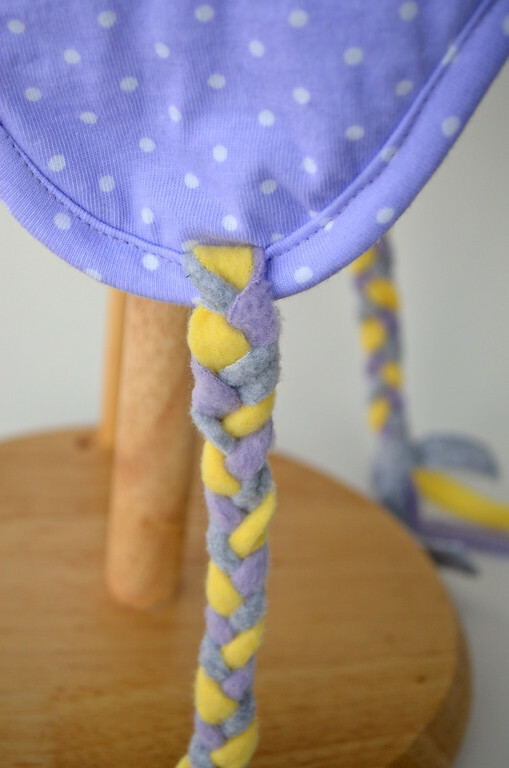 Sew the braid to the lining side of the ear flap, upside down. 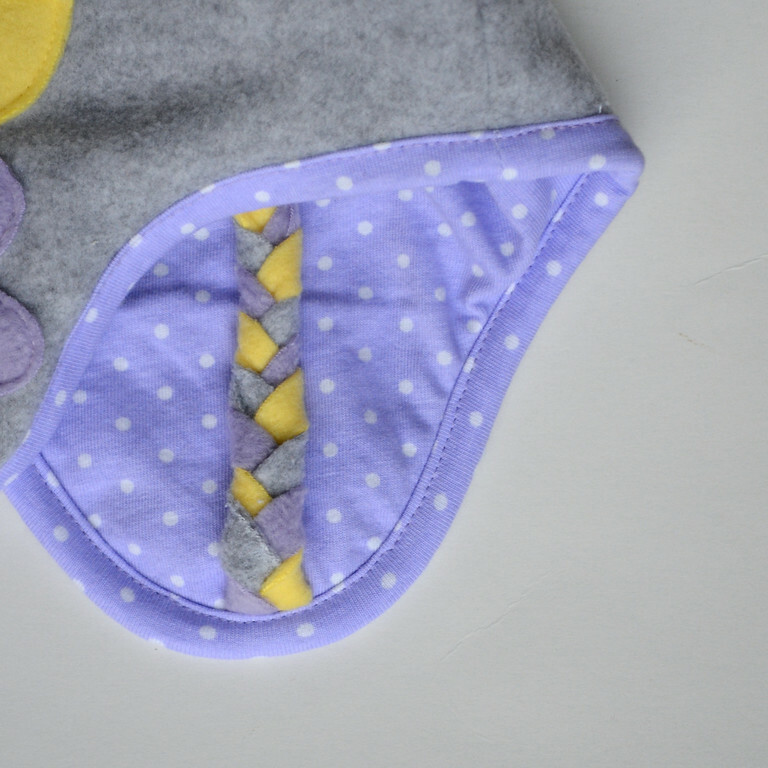 Sew the RS of the knit binding to the lining layer on top of the braid. 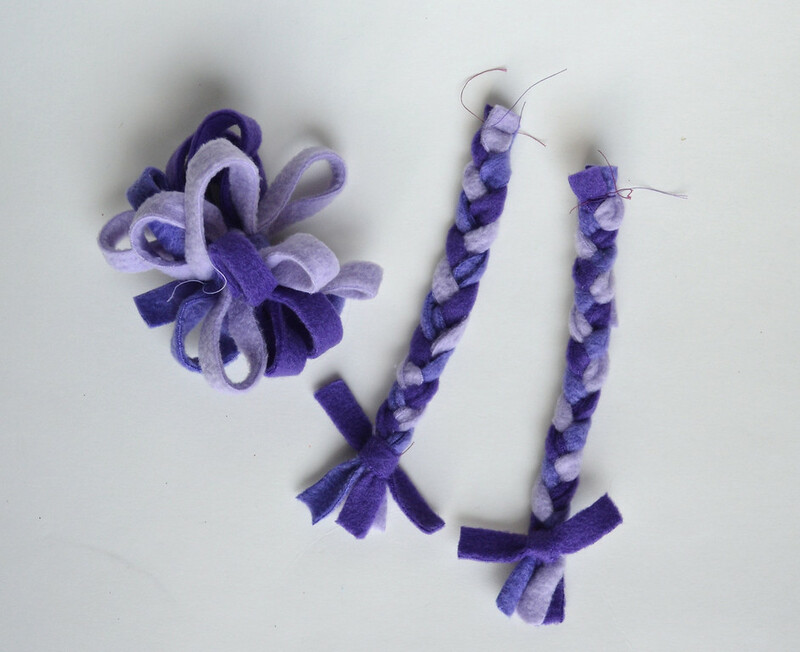 See this post for a tutorial on how to bind with knit. 4. 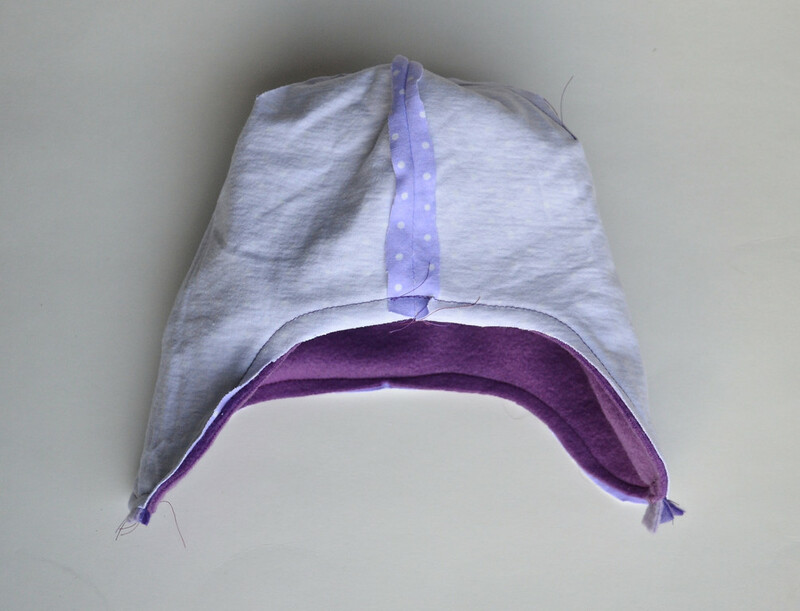 Flip the binding to the outer side of the hat, fold in like bias tape, and sew all around the hat edge. and hand-stitch it to the binding so it stays down. 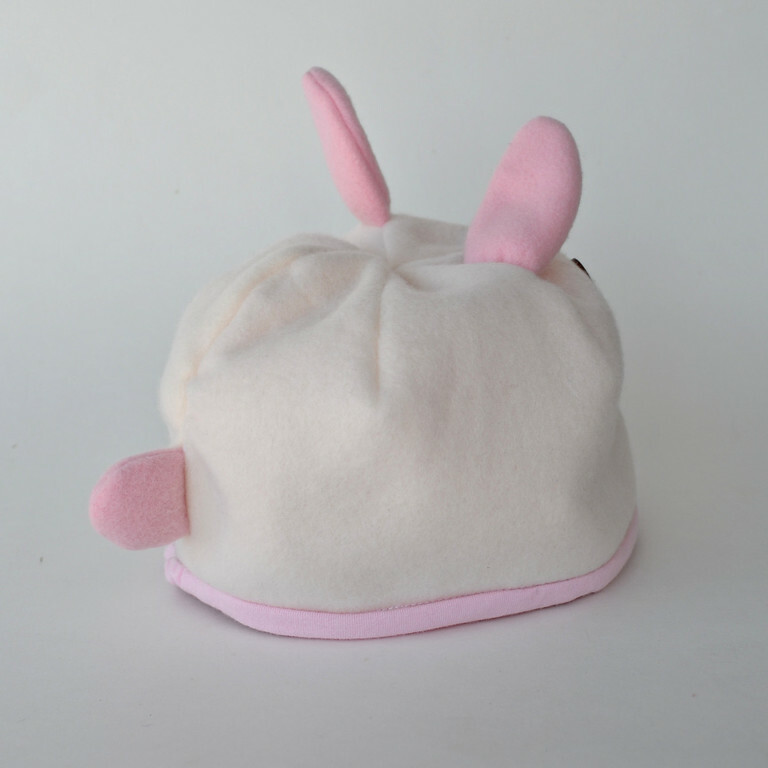 This is the hat, outer side out. This is the hat turned lining-side out. 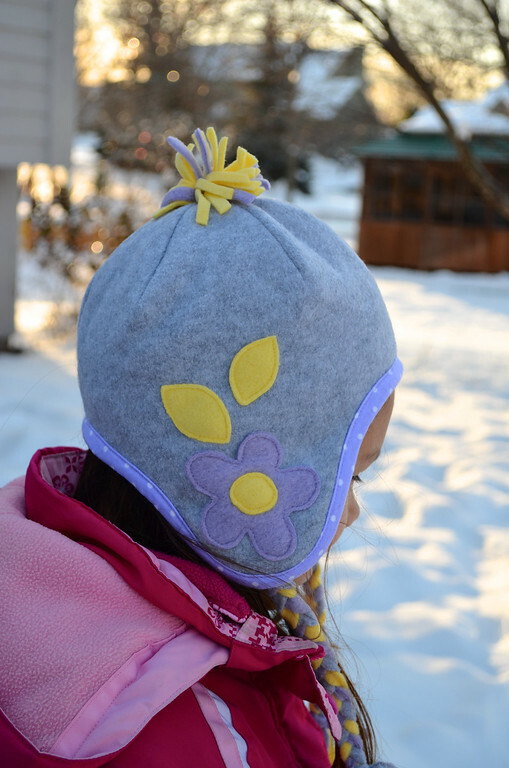 Again, theoretically reversible if you don't mind the pompom digging into the top of your head. Yes- definitely much more sensible this way out. Do you see that center front seam? My hat has that because I didn't have a large enough bit of grey fleece to cut the whole hat in one piece. It had to be done in two pieces and joined at both the front and back center seams. 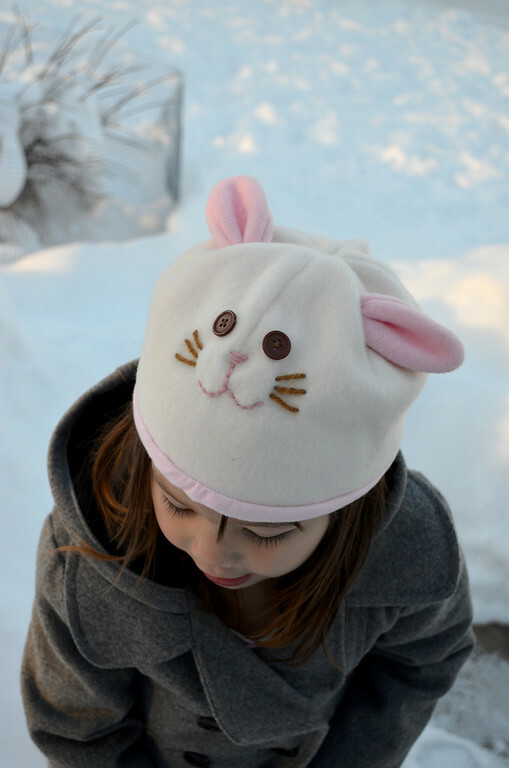 In addition to these three hats, here is a fourth hat using Pattern B, which I didn't actually sew. 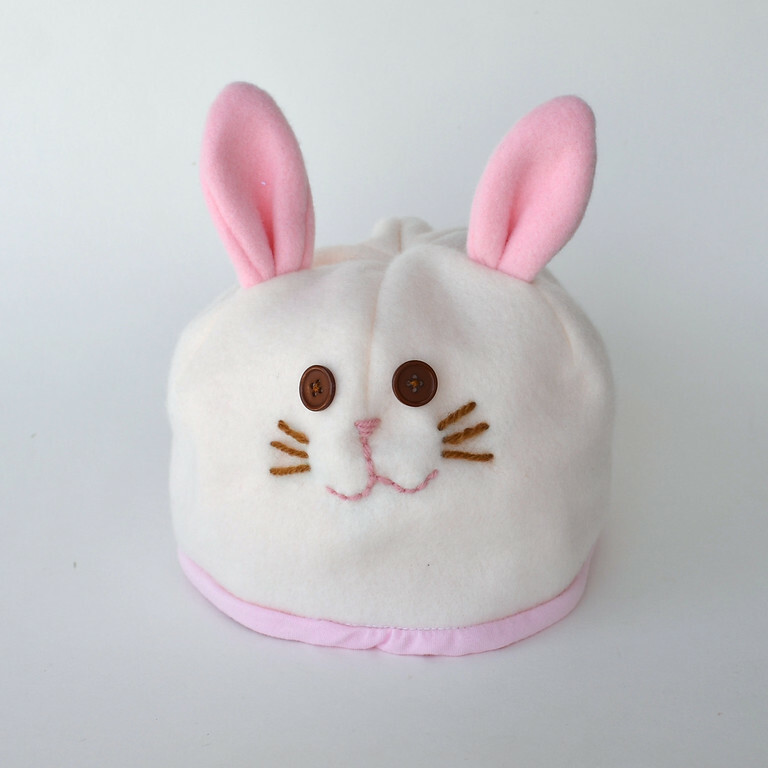 It's a good design for smaller kids who can't seem to keep their hats on their heads. 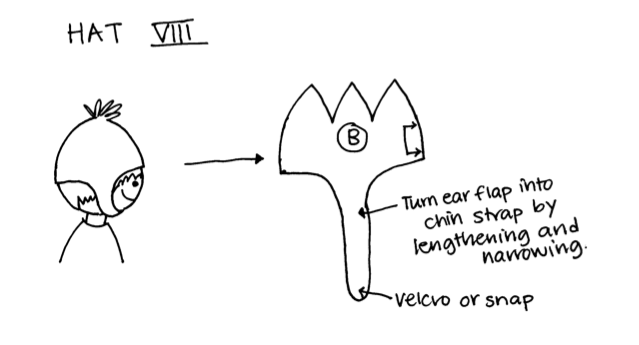 If you narrow and extend the ear flap, you can turn it into a chin strap that fastens with velcro or a snap. 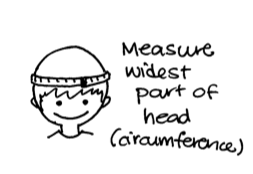 You'll have to measure around your child's head in the relevant orientation to get the actual length of the strap needed. And now, here are the pattern templates. Size 1 fits head circumferences of about 20" (Kate). Size 2 fits head circumferences of 21" - 21.5" (Jenna and Emily). Don't ask me for age sizes. Stuff like 3T or 7-8 or Medium mean zilch to me. 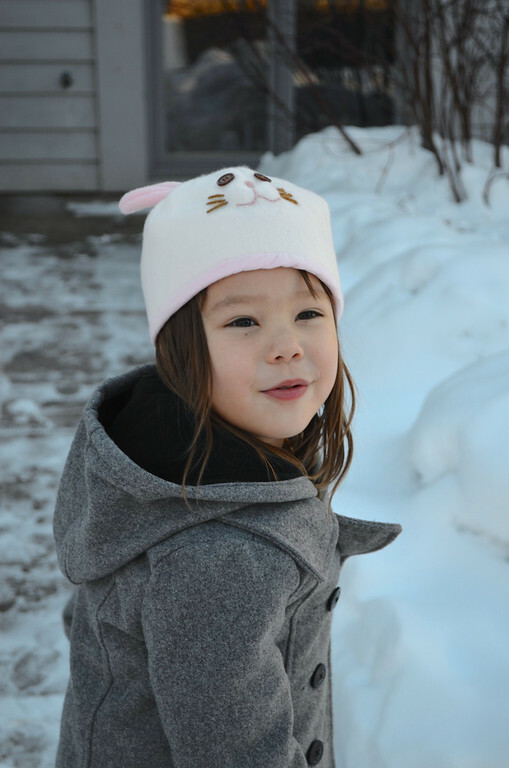 I mean, look - Jenna and Emily, who are 2 years apart in age, have the same hat size. 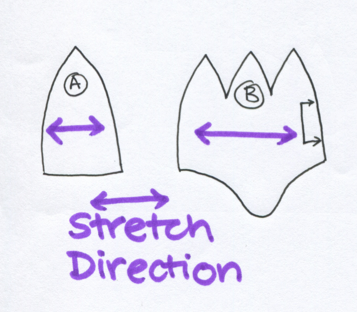 Only actual body dimensions mean anything to me when I'm sewing. 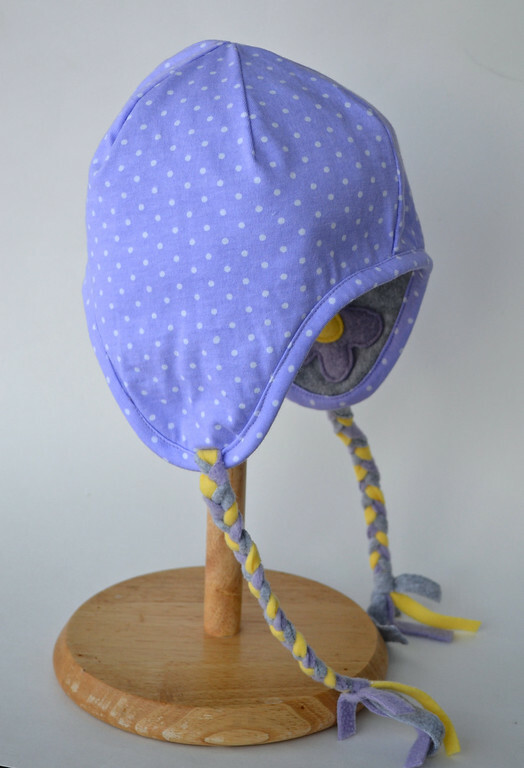 So go measure your children's heads and choose the size that works best and/or take in or let out a fraction of an inch in the seams where you need it. 2. My patterns have NO SEAM ALLOWANCES. You must add your own seam allowances. 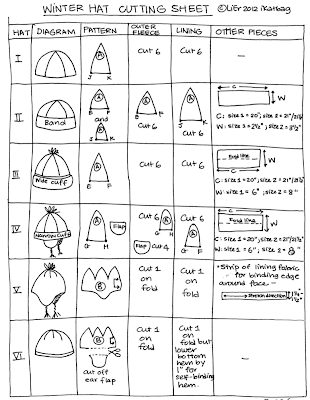 So eight hats from two patterns in two sizes, but you can easily, easily adapt them to make other designs. I considered a making myself a beanie in charcoal and black and with hand-embroidery but got bored before I even drafted the pattern in my size. There are other projects to move on to! And a new tutorial series coming up! Those are some adorabe hats, I love what you did with them! 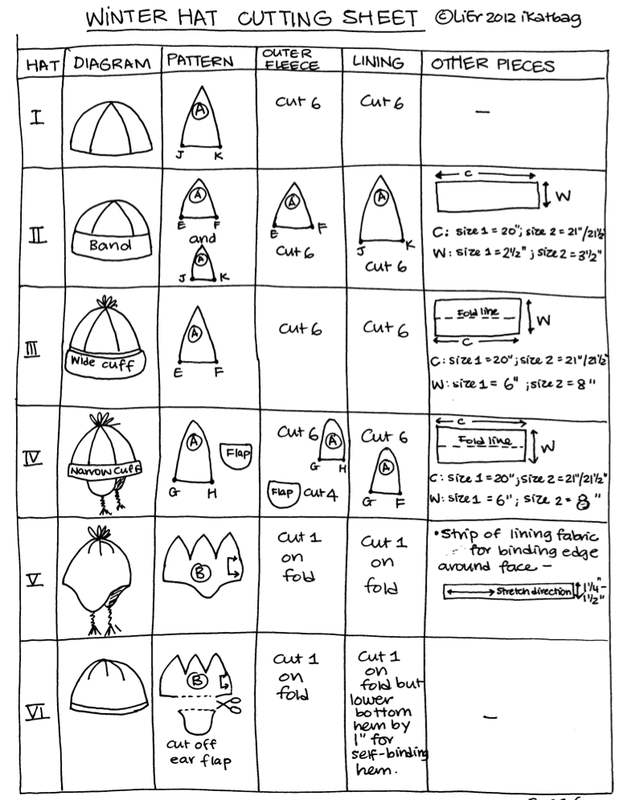 Thank you for this fabulous Description of making these different Types of winterhats. I like it very much and linked your Post on my Blog, i hope thats okay for you? I've used your sheet for my post, if you don't want this, let me know! i was told recently that the way my mind works, i would do better to make a sloper for my dress form and just sew as inspired rather than with flat patterns. hopefully i will understand and make it well the first time(s). Those hats are awesome. I am so tempted to make them. But that would require me to go buy fleece. Oh the dilemma! To buy more fabric or not buy fabric. 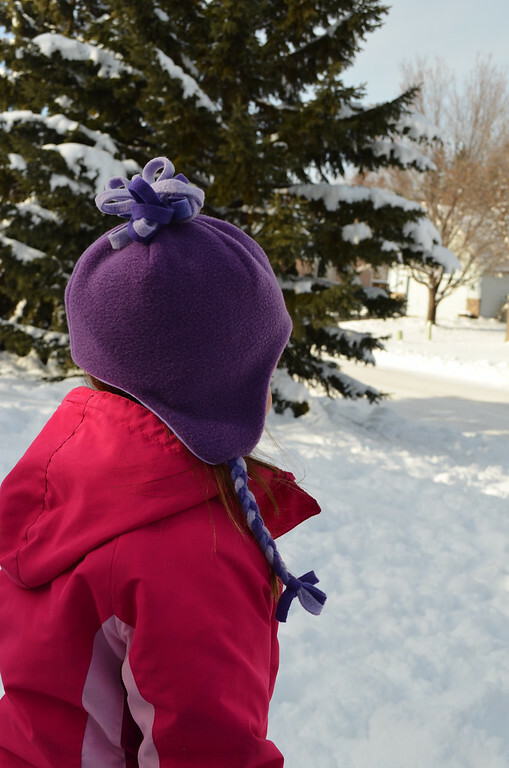 How on earth did you manage to order up snow for a gorgeous photo shoot? 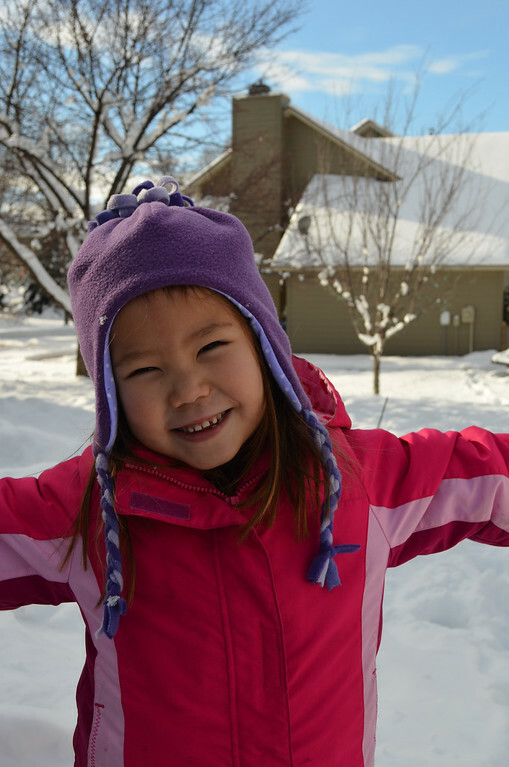 My sis lives in St. Paul - I have their weather on my google home page. 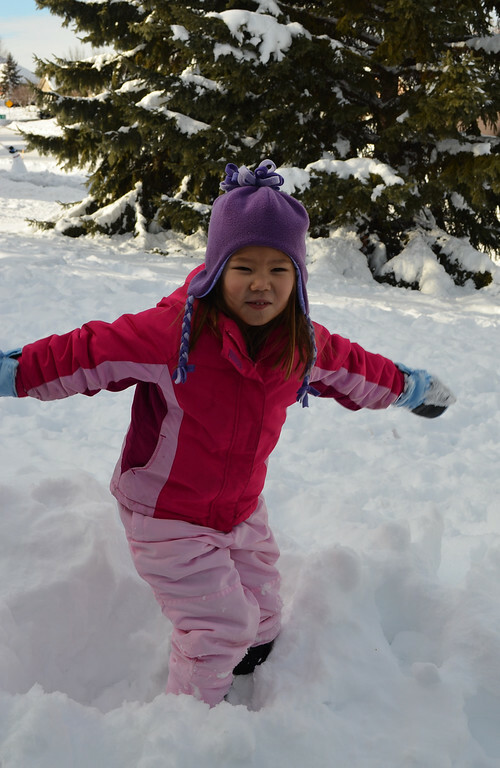 The best we could do was 37' today with snow mixed with RAIN (Willamette Valley snow). Muchísimas gracias, siempre encuentro interesante tu blog, pero hoy te has superado a ti misma. Muchas, muchas gracias desde España. Thank you, I always find interesting your blog, but now you've outdone yourself. Many, thank you very much from Spain. 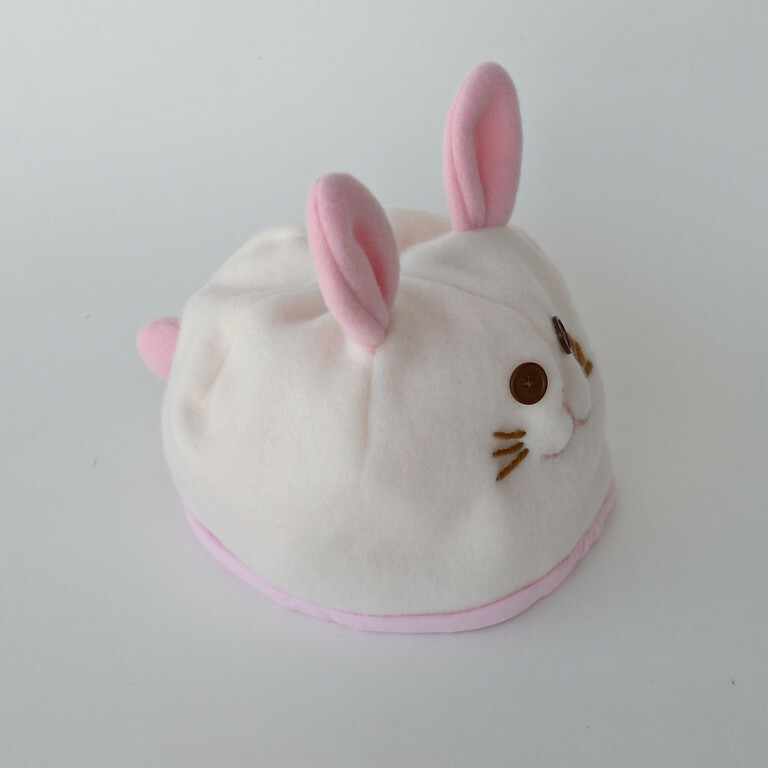 These hats are even cuter than the first ones!! The braids are a fun embellishment! They're so wonderful, and what I've scanned of your tutorial makes me wonder where you found the time to do it at this time of year! It's summer here in Australia, so I've Pinned your tute for use when the weather gets cooler. Oh, I hope to get to these this week before our FL family heads up to IN to visit our extended family. Using some fleece scraps to make up some hats is a lot more reasonable than buying some for the few days that we will be in cold weather!! Thank you so much for sharing! I love these hats! I have 15 grandchildren from age 21 to 2 years of age. I think they would all love to have one of these. I know I would! This pattern is perfect! I'm making these for my four g-grandkids! Thank You!